A million candles, gentle sung chants led by musicians, including guitar. Forty minutes of total peace. Join in with the chants (printed service sheet provided), or just sit and let your worries and fears melt into God’s hands. 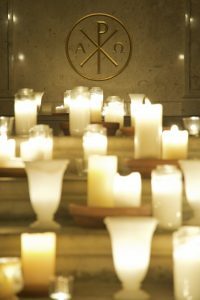 Every 4th Tuesday of the month, at 7 p.m. in our candlelit chapel. Dates may change occasionally during Lent and before Christmas. Light a candle in one of the times of quiet. If you wish, speak privately with a leader who will pray with you for healing, or for whatever is on your heart. The service is followed by a small reception of light refreshments and conversation. The Taizé Community was founded by Frère Roger in 1940. He pondered what it really meant to live a life according to the Scriptures and began a quest for a different expression of the Christian life. The Community now has around 100 brothers, and has become one of the world’s most important sites of Christian pilgrimage. Over 100,000 young people from around the world make pilgrimages to Taizé each year for prayer, Bible study, sharing, and communal work. Through the community’s ecumenical outlook, they are encouraged to live in the spirit of kindness, simplicity and reconciliation. More about the Taizé community in France.